» Forum » All Pinball » Drinking beer, playing pinball. » Drinking beer, playing pinball. I'm drinking beer and playing pinball while everyone else sleeps. I need more. More machines or more beer? Got plenty of beer. I'm at the crossroads Im sure many have been at.... If I get another machine, my wife is going to lose it. There is a dilapidated Vectur not in that shot. Trying to figure out how to overcome that. Then retreat my friend. Break the hell out to wherever you can! By foot, by Uber, by friend that owes you big time when you caught him banging not his wife! Retreat I say!!! Find that quarter stealing whore and give her your fill!!!! Awesome. That is how I roll too. NothiNG better than pinball and a few brews. I need to branch out and find some folks around here of like minds. I'm too old to pass out on your couch now, but I'm old enough to afford a cab. Indianapolis pinball unite! Still have to figure out how to appease my wife and still basically do what I want. Chug the rest of that beer and think long and hard of something she's been wanting. It just might be your green light to another pin. There is a dilapidated Vectur not in that shot. Another few beers and it might change back to a Vector. Ahhh touché my mustachioed friend! 'Twas a slip of the finger! Marios on shrooms and headed through the Stargate again! Your avatar is not drinking? I think you mean NIB (New in bottle). HUO would indicate you collect piss. How did it go last night? 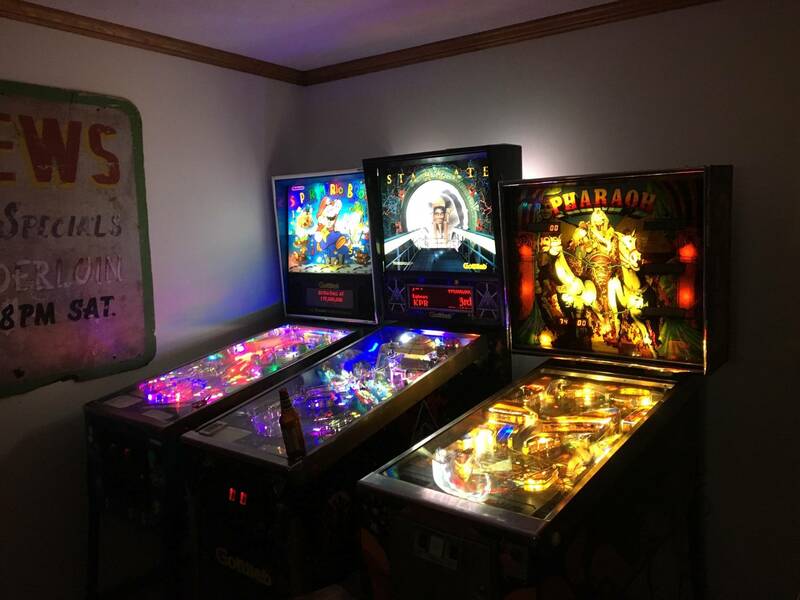 Did you get enough pinball and beers last night, or do you still need more? Jodester had a pinball party down here in sw LA and we all had a lot of fun, except for KingNine and Allen who arrived late. They probably still need more. I got started too late, but I had a good time. Saturday night was a fine night for beer and pinball. Had a couple of friends over to help me with the task.